Jainaraine Singh, Marcel Gaskin, Renatta Chuck-a-Sang and Terrence Campbell. Reform, Inform, Sustain Educate (RISE) Guyana, a newly-formed non-profit organisation, on Wednesday announced that it would be embarking on a countrywide push for reforming Guyana’s constitution over the next two years, and said its members are free to engage in active politics with any party of their choice. “We strongly feel that unless an external force is brought to bear, the politicians would continue to drag their feet and/or institute changes that do not wholly address the problem in its entirety. This is the reason why RISE was formed,” said one of the organisation’s directors, Marcel Gaskin at the call for constitutional reform held at Moray House, Camp and Quamina Streets. 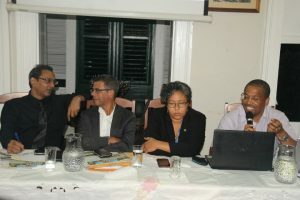 Leading figures include Attorney-at-Law, Timothy Jonas; Attorney-at-Law, Nadia Sagar; prominent city businessman, Terrence Campbell; civil engineer, Marcel Gaskin; businesswoman, Renata Chuck-a-Sang; university lecturer Tyrell; civil servant, Remington Nelson; university lecturer and psychologist, Will Campbell; Realtor, Jainaraine Singh, Sharon Lalljee-Richard and Arun Richard and Luanna Falconer among others. Established in June 2017, the group of free-thinkers, the group plans to establish groups across the country and consult with Guyanese to ascertain their basic concerns and find out what types of constitutional reforms they would like to see to address those concerns. “These citizens believe strongly that constitutional reform is critical to achieving executive accountability, racial harmony, and political, social and economic inclusivity,” the organisation states. Now that government has this week announced that a constitutional reform bill would be tabled in the National Assembly before the two-month parliamentary recess begins in August, RISE wants wide and meaningful consultations to be held by June 30, 2019 to make way for a reformed constitution. RISE’s timetable will see the commencement of the first round consultations in early August in Region Four and then extend to the other nine administrative regions. Progress will be reviewed every quarter, depending on human and financial resources. “We plan to reach each and every community so that every single voice is heard and every single opinion is registered,” said Singh. Civil society, government, opposition and all political parties, diplomatic missions and trade unions would be consulted. Chief Executive Officer of Roraima Group of Companies, Gerry Gouveia, who is chairs the governance committee of the Private Sector Commission, welcomed RISE’s initiative and pledged to provide logistical support to reach some of the far-flung areas of Guyana. This man posed tough questions to RISE’s executive members about the political origin and future of RISE. said Wednesday’s event was not a launch pad for a new political party, but he left open the door for his organisation’s members to become engaged politically. “However, if through the process of consultation and the process of finding out more on how constitutional reform can be achieved, if it is necessary to go the political route, I think many of us in this group are prepared to do so,” he said to mild applause. 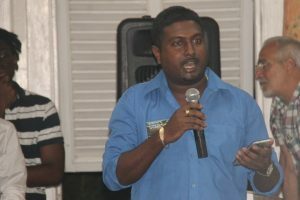 Singh said he is not part of RISE because he is aggrieved except by the fact that there is no constitutional reform in Guyana. He said it was not impossible for RISE to evolve into a political party. “It’s not a probability right now, but it’s not an impossibility,” he said. That position was moments later countered by Campbell who categorically stated that, “RISE itself is not a political party.It’s not interested in being a political party. We are interested in constitutional reform but there is nothing stopping them going forward once this is not done and being active in politics,” he said. Acknowledging that questions about RISE’s political future is a “very thorny issue,” Campbell said his organisation’s focus is on constitutional reform and if that process is successful, the RISE members might take a back-seat or may get into elected politics. “I did speak to the fact that we would like to see the electoral space of our democracy reinvigorated and the members of RISE that I know are people of integrity, who are post-racial and personally I would like to see them- regardless of whether their objectives are achieved or not- I would like to see them get involved and all of you get involved in the political space post 2020 or post constitutional reform,” he said. Campbell stressed that “for the moment we are not a political party” and Wednesday’s activity was not the launch of a political party “but we are all political animals; we are here because we are interested in politics.” He said RISE members would be free to engage any political party of their choice after constitutional reform. A section of the packed audience that turned out at the ‘Call for Constitutional Reform’ launch by RISE at Moray House. 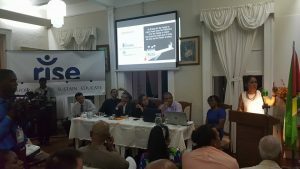 RISE, describing itself as a body of “grassroots citizens,” plans to study the many criticisms of Guyana’s constitution and would take action based on the merit of each. Campbell cited the need to break down why constitutional reform is necessary and seek feedback from participants especially as Guyana prepares to become an oil producer in 2020- the same year the next general and regional elections are due. “Every citizen in Guyana should consider it their duty to participate in the constitutional reform process because the post 2020 oil economy is far too important to be left in the hands of any government and RISE is non-partisan. We do not care whether it’s the coalition government or the PPP Civic or any other party,” he said. Against the decades-old situation in which political parties in opposition clamour for constitutional reform but drag their feet on the process when they get into government, Gaskin made it clear that RISE would be mounting pressure on government to accelerate the process for the benefit of the disadvantaged. “What RISE feels is that it is time that some sort of pressure be brought to bear on those in authority to actually deliver on the promises of CR (Constitutional Reform),” said Gaskin, the brother of Minister of Business, Dominic Gaskin. The organisation wants broad-based consultations to be held with all communities and marginalised groups. “It is our considered opinion that civil society must confront the powers that be to ensure that the new constitution is not incremental but truly transformational,” he said. Campbell noted that any rise of a third party – “and we are not”- leads to the cry of race vote-splitting instead of concerns about the needs of the citizens aimed at retaining power and influence. RISE is worried that if there is no constitutional reform, Guyana will erupt into elections violence in 2020. “Our fear is unless there is constitutional reform, the 2020 election- when the spoils will be massive-we may have a repeat of electoral violence if there is to be a change in government. I hope that that is sobering thought and that it will drive home the importance of us addressing this issue now and comprehensively,” he said. RISE signaled its desire for the proportional representation (PR) electoral system to be replaced by a return of the constituency system because PR has seen accountability being trumped by party loyalty. “At RISE we are not going to say whether the change saved Guyana or it didn’t. What we did say is that change from a constituency system to proportional representation was the beginning of the decline in accountability and the emergence of loyalty of elected officials to the party and not to the people,” said Campbell. 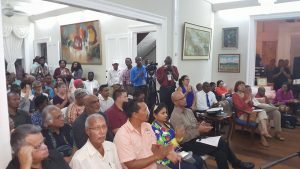 He added that Guyana’s political parties have encouraged a pattern of ethnic voting that could result in either victory or worse case a block of seats in the National Assembly that allows them to remain relevant. RISE wants the constitutional reform process to address concerns about ethnic cleansing, abuse of state media, presidential immunity from criminal suit, no provision for individuals to contest for the presidency and seats in the National Assembly, facilitating post-elections coalitions repeal of the list system, parliamentary confirmation processes, expansion of technocrat ministers or cabinet members who are not parliamentarians, limitations on campaign financing, eligibility of remigrants to contest in elections except for the presidency after three years.